Hi everyone! Our electricity has been out since early Wednesday morning, which explains why we haven’t posted since Monday (no WiFi either). Our school has been cancelled for the past few days due to power outages as a result of ice, and on Monday we had a day off because of snow! I’m pretty sure Easter break will be virtually non-existent. Anyway, we are thankfully staying with family friends, who have generously welcomed all eight of us (not an easy task!) for the past two nights, and we also spent yesterday with out grandparents. Hopefully our power will be on soon, as well as the power of thousands of others who are stuck without heat on these below-freezing days. Needless to say, we haven’t been able to do any cooking at home (although we did make waffles and cookies where we are staying). However, we made these pancakes on Sunday morning last weekend, and they were awesome! 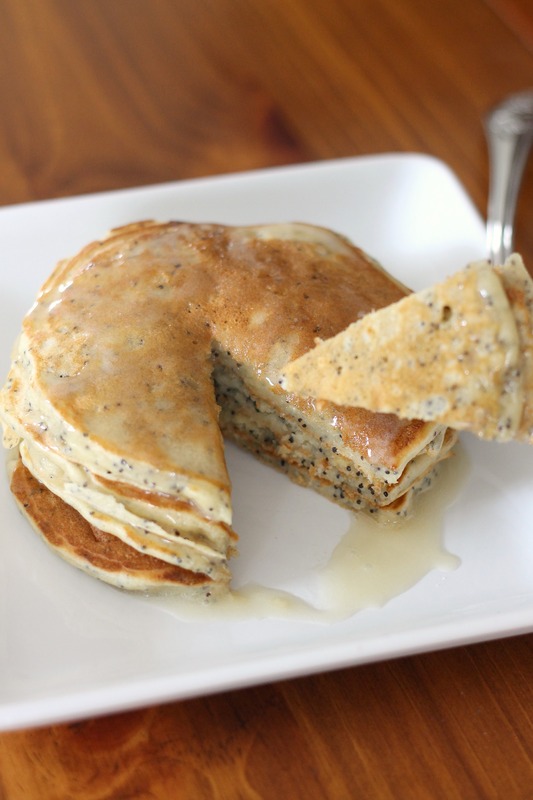 They are super fluffy and have a wonderful flavor from almond extract and poppy seeds. They are really taken over the top by an almond syrup, which is phenomenal. It is very easy and has a unique but delicious flavor. I definitely recommend making the syrup if you’re making the pancakes. A stack of these is just right on a cold winter day! Hopefully we’ll be back in our kitchen this weekend. Preheat a griddle to 350 degrees. In large mixing bowl, whisk together flour, poppy seeds, baking powder, baking soda and salt. In a separate mixing bowl whisk together buttermilk, milk, sugar, eggs, vegetable oil, applesauce, almond extract and vanilla extract. Pour buttermilk mixture into dry mixture and stir just until combine. Batter should be slightly lumpy but no flour streaks should remain. Pour about 1/4 – 1/3 cup batter on greased preheated griddle. Flip pancake when golden on bottom and then cook opposite side until golden. Keep warm while you make the syrup. For the syrup, melt butter in a saucepan over medium heat. Whisk in sugar, cream, and buttermilk. Cook, stirring frequently, until mixture begins to boil and sugar is dissolved. Remove the syrup from heat and stir in baking soda and almond extract. Whisk for 10 seconds until syrup is foamy. 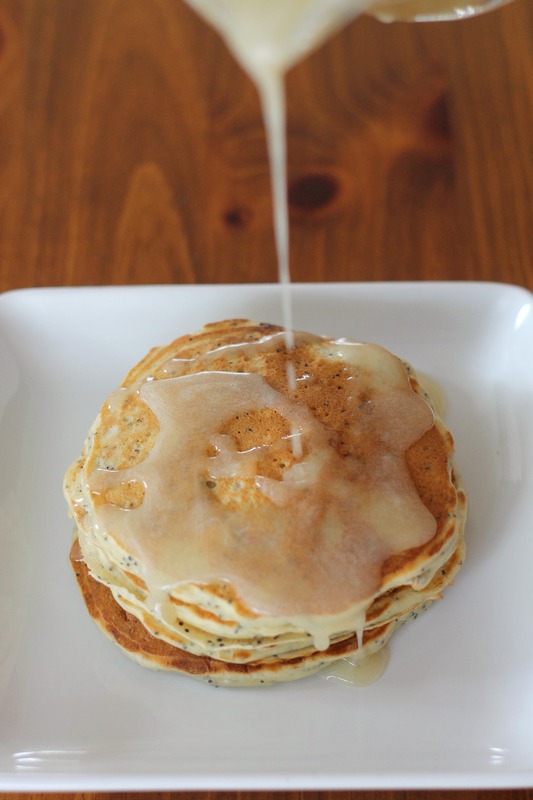 Serve warm over pancakes.